Great review!! I really enjoyed this one too. I thought that it was beautiful. It had a slight bit of creepiness to it at times, but not much. I haven't been too afraid to pick up his novel but I just never read one lol. I think the size of most of his books are intimidating. I have one here and it's like 1200 pages O_O. This one sounds like a good read though I like how weird and creepy his movies are so I def. want to try one of his books! Oooh great review, Jennifer. I just bought this one recently and I can see myself really liking it. I love that you say it conveys emotion so well, because I am all about that. Great review! 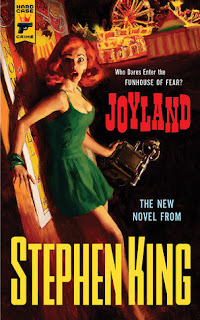 I agree, it really is a great summer read, and it's one of the few Stephen King books I'd feel comfortable recommending to friends who normally don't read thrillers, horror, etc. This sounds like my kind of King book. I can't handle the super scary anymore (I am such a wimp nowadays). This is so up my alley - I love dead characters walking LOL. My husband owns a number of SK books, but they're usually a though read for me...it's not the gore in itself (The Last Vampire/Thirst by C. Pike and the Supernatural TV series are gory, right? and I usually don't even flinch at them), so much as the disturbing images he loves to use. I was only able to stomach The Shining so far...but this one sounds safe...and interesting. New follower BTW, and I hope to discover new exciting thrillers and the likes here! I was very curious about this one. I don't see why so many people assume all of his novels are horror. I don't even find the ones I've read remotely frightening. Glad to hear its a good one! I haven't read a Stephen King novel in a really long time. I like horror, but for whatever reason I hate reading about it. Maybe this one would be good for me. I like coming of age stories and the mix of crime and a ghost story sounds like this one is definitely unique! Glad you liked it! I'm taking it on vacation with me, so I've been waiting and waiting, and it's just been staring at me from my TBR bookcase (in my special Books to Take to the Beach pile). I agree, NOS4A2 did feel more like a King book (the talents of main characters reminded me of The Shining). Loved it though, and looking forward to this one!